Still dickering with the black paper. Some look so bad that I am not inclined to post them. They are studies in what went wrong- learning experiences. The humidity in Florida is so high that I have to work indoors. Pastels absorb moisture like little sponges then refuse to paint smoothly. I have a box of Conte pastel pencils. The humidity cracked the wood casings on every one of them. The box filled with stick pastels has been indoors now for three days and they are beginning to paint smoother. Trouble is, pastels are messy. The dust goes everywhere. I work with plastic on the tabletop to prevent the dust from settling into the wood grain and run a swiffer under and around the table frequently to keep the dust off the floor. Guess I will have to find a place indoors to store the pastels permanently to help keep the moisture out. I have pastels, I have oils, I have no space to work that can be left as is so I am not doing any artwork. Pastels are, indeed, a nuisance. I attended an art class in the local park a couple of years ago -- I did the homework, sort of. I got some skill back -- I hadn't drawn in years. I need a push I guess. I like your swan. The black paper is very dramatic. Obviously artwork is not, for me, a "must" as I believe it is for you. My "must" besides workouts is piano. But I do think I should be doing some. For me, my passions are writing and painting. Last year. I painted nothing- not a single painting, pastel or watercolor. I did do some writing and spent far too much time editing newsletters for the USCG Auxiliary. 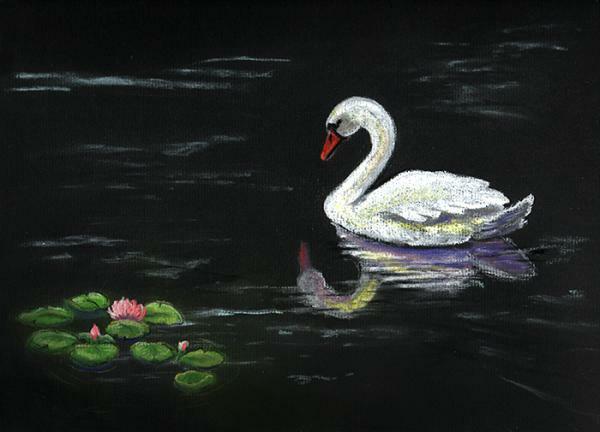 I started this year out with the one Coast Guard painting and am now experimenting with the pastels. It is getting back into art as a part of my life. I never learned to play an instrument. I envy that you play piano. I am grateful for the mistake of buying black paper. Experimenting with it has drawn me back into drawing and painting. The black does add drama that would otherwise be absent from this simple drawing.